A75KC Belt. 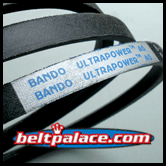 UltraPower AG V-Belt (Kevlar Covered). 1/2" Wide, 77” Length OC. Replaces Standard, Raw edge A75, 4L770 FHP V-Belts. 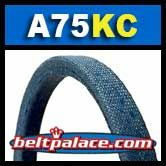 Kevlar wrapped replacement for standard A75 V-BELT. Features bias cut, cross woven Kevlar fabric cover. Superior performance on heavy clutching applications for Ag and Lawn Care machines. One tough belt! Replaces MTD 954-04062, 754-04062. Lawn care/Stens 265-226 (low grade). Replaces Gates 6875 POWERATED V-BELT.